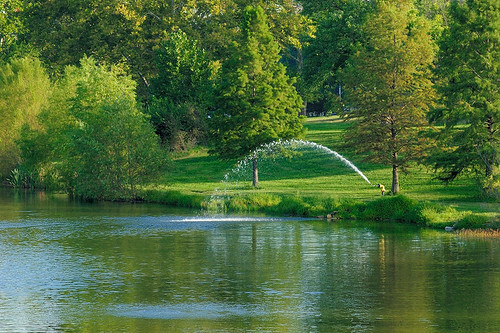 NEW YORK CITY has Central Park, but Saint Louis has Forest Park, which is twice as interesting and half as crowded as its eastern cousin. 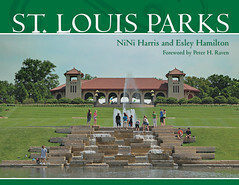 The park was established in 1876, developed for the Louisiana Purchase Exposition of 1904, and afterwards became home to several major cultural institutions. After suffering decline during the 1970s, the park was lately redeveloped. I took these photos the other day, at sunrise. 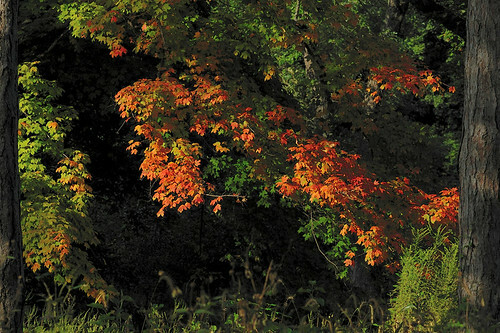 See the companion article Forest Park at Sunset. Please enjoy! 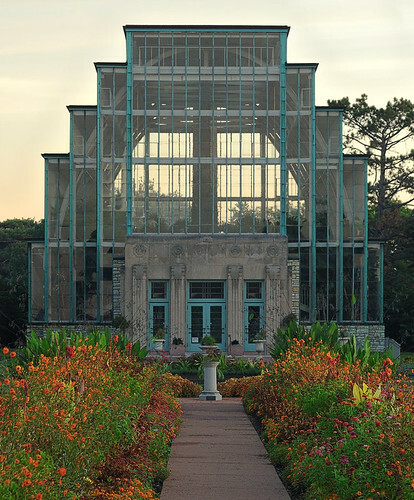 The Jewel Box, a conservatory, built in 1936 in the Art Deco style, is popular for wedding receptions. 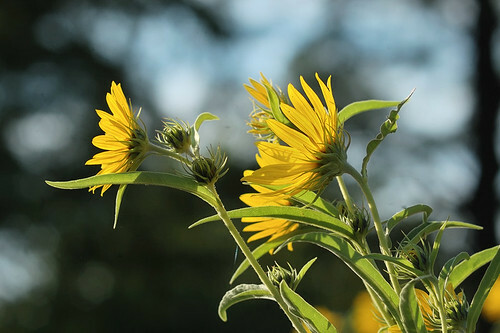 I used an antique camera lens for all these photos; it has superb quality at a bargain price, and a few of these photos are the most optically sharp images I've ever captured. But there are problems with this lens: it deactivates the exposure meter, must be manually focused, and does not zoom, which forces me to actually think about how to use the camera properly, as well as making me move around more to get the best composition. 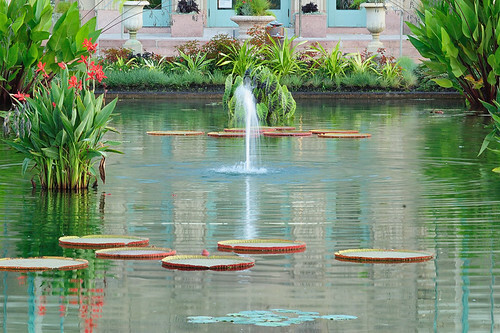 Lily pond with fountain, in front of the Jewel Box. Typically, I color balance my camera so that (as much as possible) subjects that in fact are white, black, or gray, are also neutral in the final image. However, I kept my color balance fixed for all these photos, which ought to give you an impression of the color of the light from the rising sun. These gates marked the entrance to the former Vandeventer Place private street. The neighborhood had its heyday in the 1890s, but soon succumbed to urban decay. 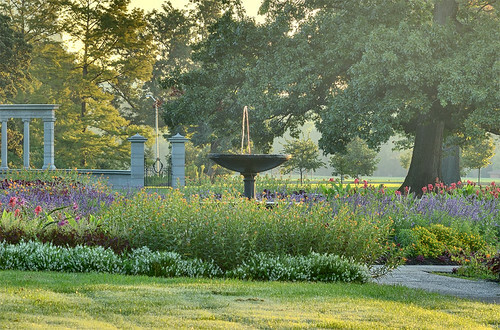 A Veterans Administration hospital now stands in its place, and these limestone gates were relocated here as a picturesque garden decoration. 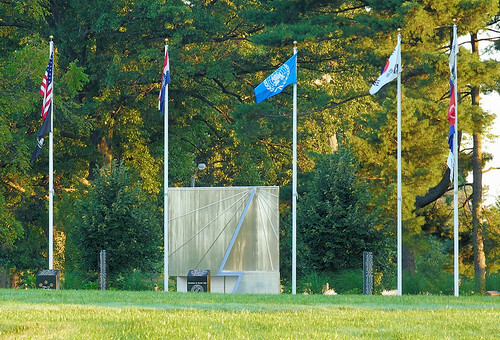 The Korean War Memorial is a sundial, made of stainless steel. Dedicated in 1989, this sculpture commemorates the 54,246 Americans who perished in the Korean War. Its inscription is from Terence, Diem adimere aegritudinem hominibus. 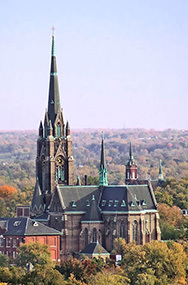 It was designed by Brother Mel Meyer of the Society of Mary (the Marianists), who resides at Vianney High School in suburban Saint Louis County. 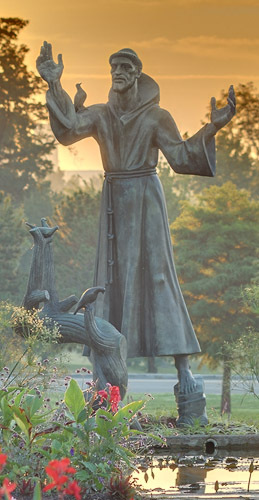 Statue of Saint Francis of Assisi, by Carl Christian Mose, 1962. 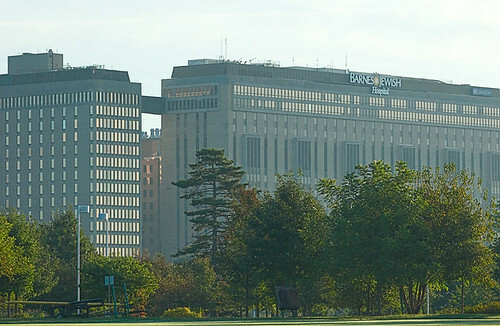 Tall buildings flank the park's eastern and western edges. Barnes-Jewish Hospital. 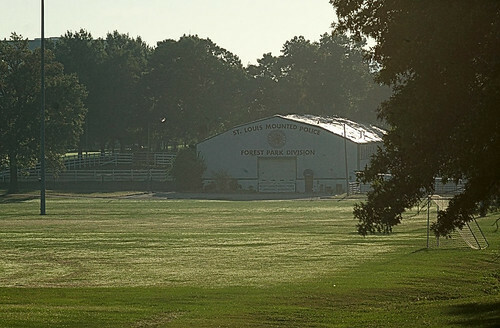 At the far end of Aviation Field is a former aircraft hanger, which until recently was used to stable the horses of the Saint Louis Mounted Police. 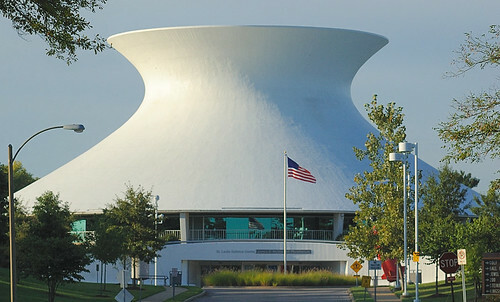 The Planetarium is a part of the Saint Louis Science Center. An enclosed pedestrian bridge, not seen here, connects this structure with the rest of Science Center, which sits across Highway 40 south of the Park. Designed by Gyo Obata and completed in 1963, this structure epitomizes the style of High Modernism, with Obata being perhaps one of its foremost practitioners. One of the ironies of Modernism is that the best examples of the style are by those who had a grounding in the orthodox artistic tradition (reflected in this building's Latinate name and Euclidian form); when architecture schools divorced themselves from the past and replaced truth with Marxist ideology, the resulting products likewise suffered. But the recovery is underway. 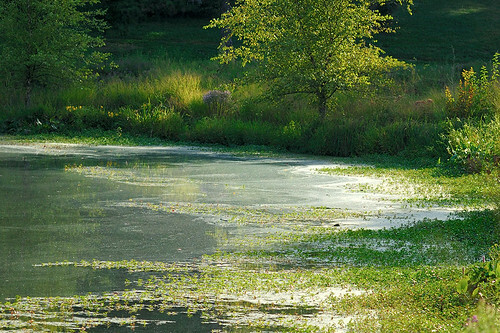 The River des Peres once flowed through Forest Park, but it was prone to flooding and much of the land was swamp. The stretch of this creek that goes through the Park now is underground in concrete tunnels. However, artificially maintained watercourses now flow through the lowland in the park. 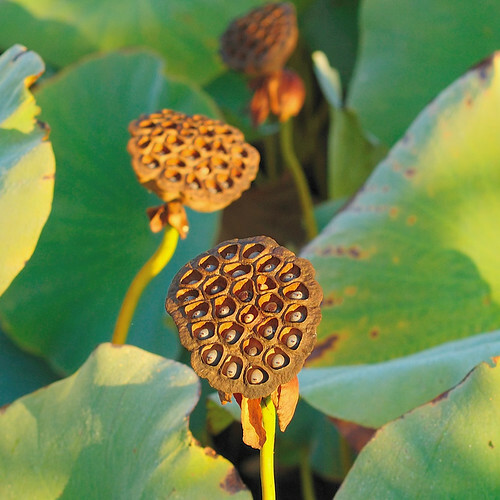 A few years ago, the artificial ditches looked rather unattractive, but vegetation has made the area picturesque. 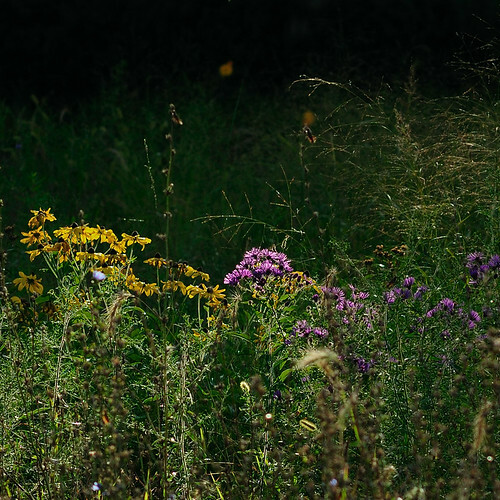 Wildflowers now cover areas that were bare dirt just a few years ago. 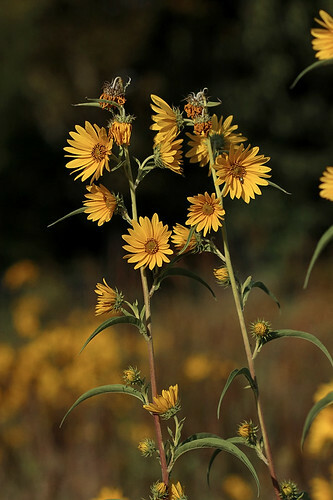 In late Summer, it seems that nearly all wildflowers in this region are yellow, and are of the Compositae (or Asteraceae) family of plants that include the daisies and sunflowers. 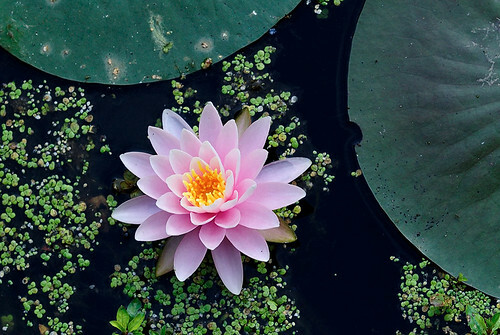 Water lily, as seen from a walkway over the water. 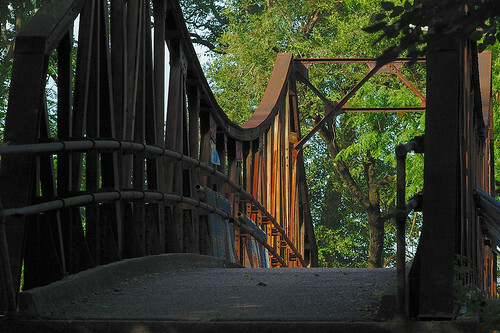 Victorian footbridge, dating from 1885. Two highways and a railroad go through the park, making some parts almost inaccessible and disjointed from the rest of the park. 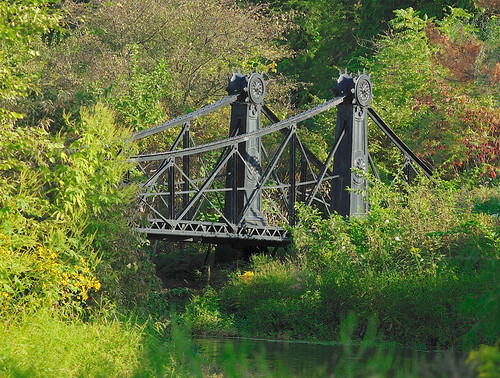 This bridge goes over a railroad track, now used by the Metrolink light rail. See the article Forest Park at Sunset. 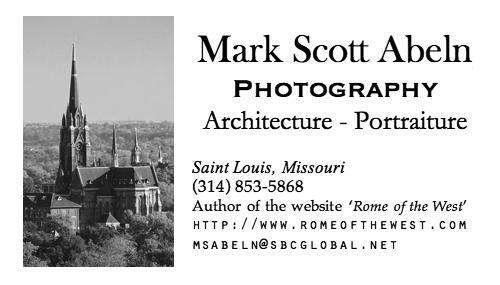 Mark, I don't always agree with you religious interpretations but your photo's of St. Louis and areas south of the city really bring a smile to my face!! Thanks so much!